If you’re looking for new recipes to make using your spiralizer, this one’s for you! 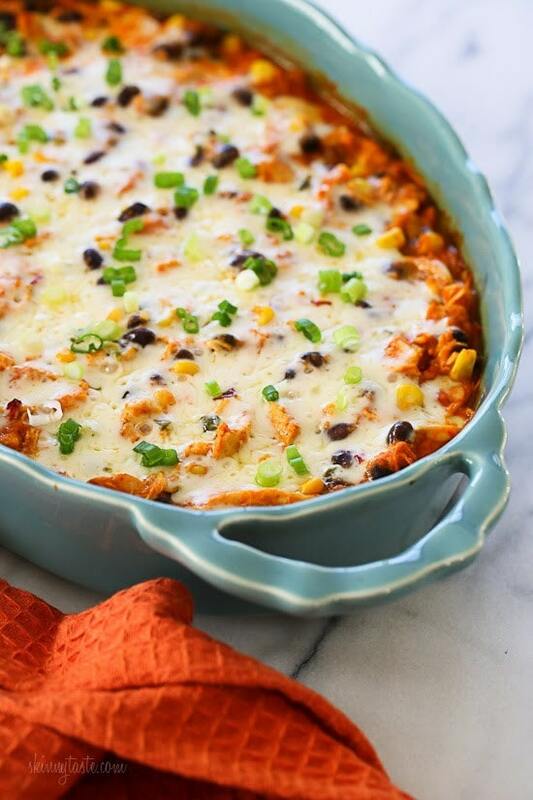 This Mexican inspired casserole is made with spiralized sweet potatoes, shredded chicken, black beans and corn in a delicious guajillo pepper sauce topped with melted Pepper Jack cheese – SO good, and the portions are very generous! I’ve been experimenting with my Paderno Spiralizer, last week I spiralized broccoli stems with turned out awesome in this Spiralized Beef and Broccoli dish. This week I decided to spiralize a sweet potato. Normally I simply roast them, but my friend and I brainstormed thinking about what else to do with it and came up with this dish. The sauce is AMAZING, a recipe she got from her Mexican friend made from dried guajillo peppers which are very mild in heat. If you want this spicy, you could add some chipotle en adobo to the sauce as well. If you cant find dried guajillo chili peppers, I suggest using 2 to 3 tbsp chipotle chilis in adobo sauce in it’s place although it will be spicier. 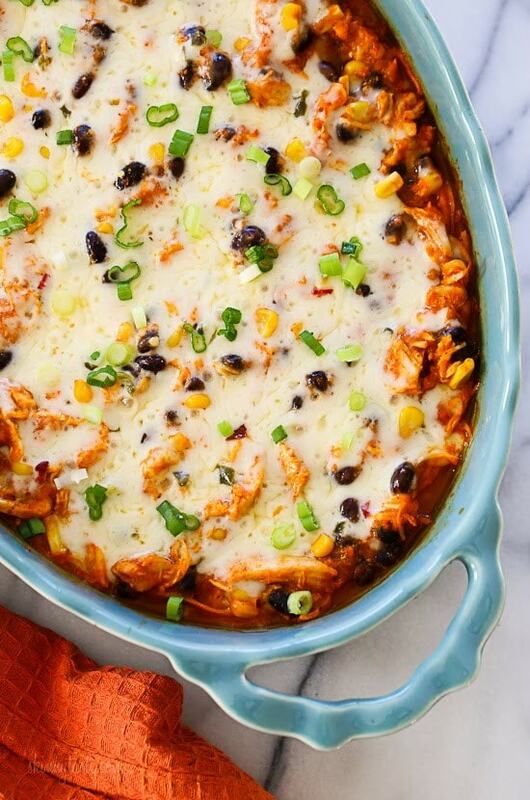 The quickest way to make this is using leftover chicken. 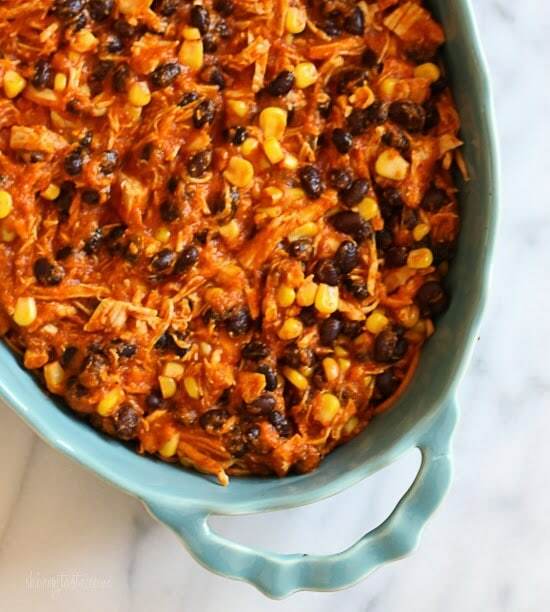 I usually have shredded chicken on hand that I make in the slow cooker, you can see that recipe here or boil it 10 minutes on the stove as mentioned in the recipe below. Grab a few skinless breasts, and throw them in your crock pot. 24 oz (about 3) boneless, skinless chicken breasts, trimmed of all fat. Add enough water or reduced sodium chicken broth so it covers the chicken. You can season your water with salt if you wish. For more flavor you can add a quartered onion, 1 celery rib, and/ or a sprig of fresh parsley. Set it for 4 hours on HIGH. Remove the chicken and shred with 2 forks. Use the shredded chicken in any recipe that calls for it or refrigerate for up to 3 days. Discard the rest. Makes about 18 oz cooked chicken. 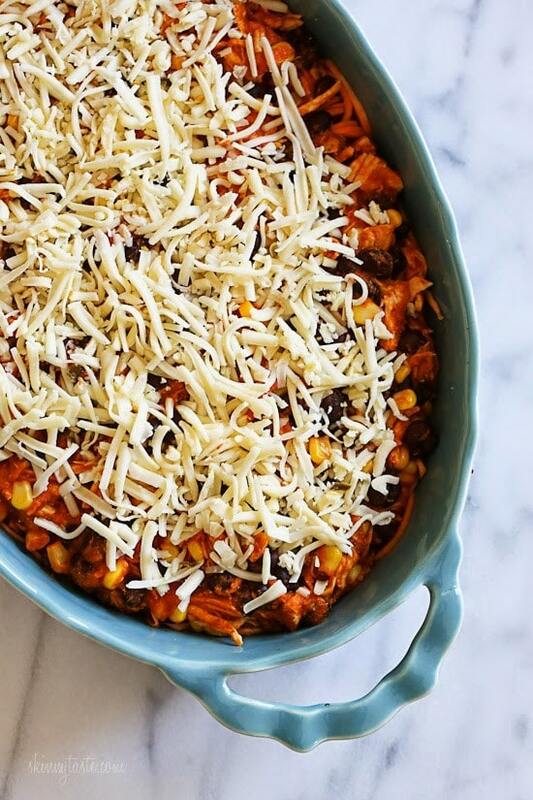 This Mexican inspired casserole is made with spiralized sweet potatoes, shredded chicken, black beans and corn in a delicious guajillo pepper sauce topped with melted Pepper Jack cheese – SO good, and the portions are very generous! 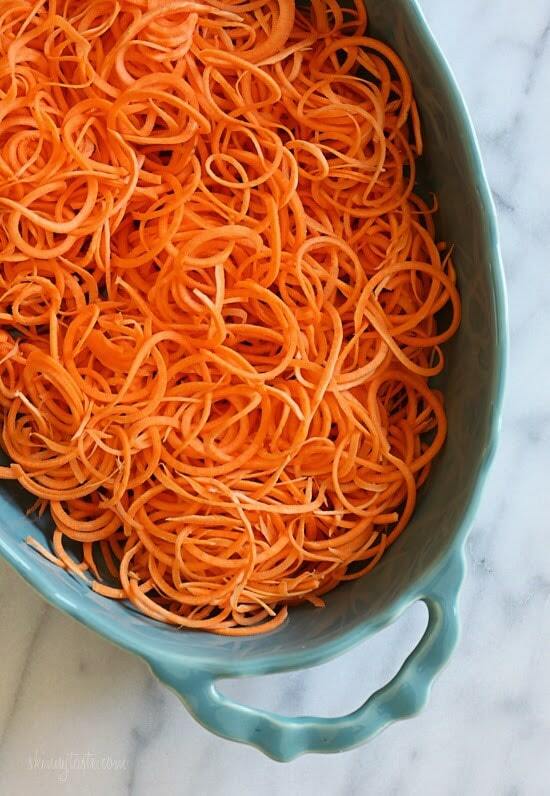 Spiralize the sweet potatoes with the smallest noodle blade and place them in a 9 x 13 oval casserole dish. If you’re cooking the chicken, bring 2 cups of water to a boil in a medium pot and add chicken breast, cook 10 minutes. Remove from water, set aside to cool and shred the chicken. Place in a large bowl. 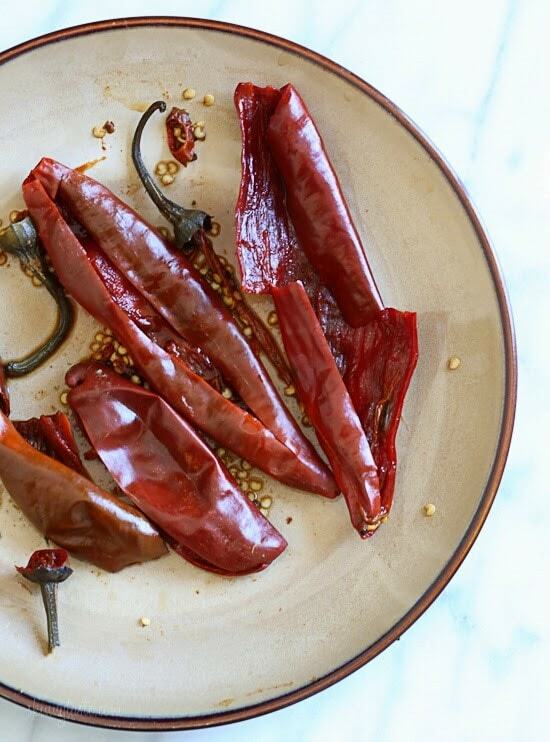 Bring a large pot of water to boil and add guajillo peppers, cover and simmer on medium until the peppers are soft, 10 to 20 minutes depending on the pepper. Remove peppers and let cool, cut the stem and and remove the seeds and the inside of peppers. Transfer to a blender. Add 4 tomatoes to the same boiling water and cook 10 minutes. Remove with a slotted spoon, peel the skin and transfer to the blender. Blend until smooth. 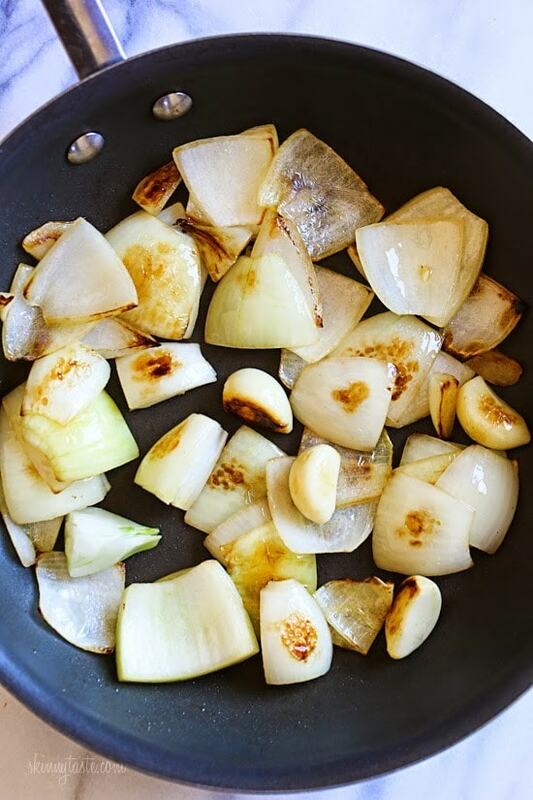 Meanwhile, in a medium skillet, heat the oil over medium-high heat and add the garlic and onion, saute until browned. 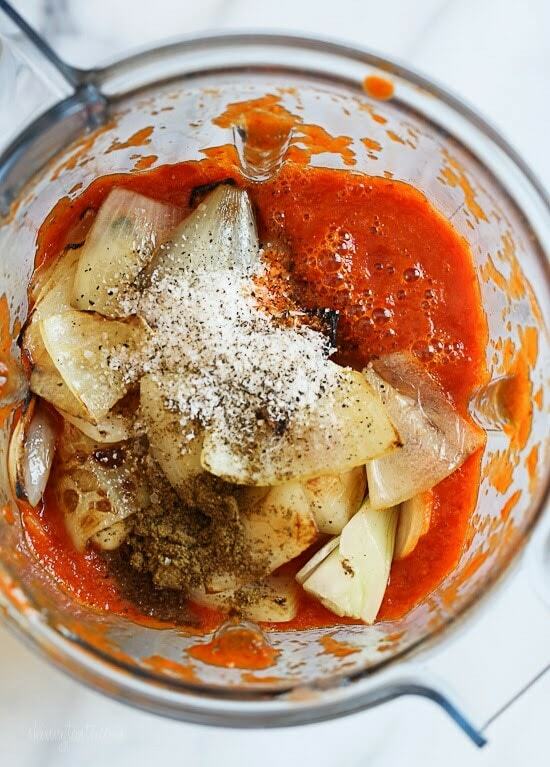 Transfer to the blender with the sauce along with cumin, salt, and pepper and blend well. 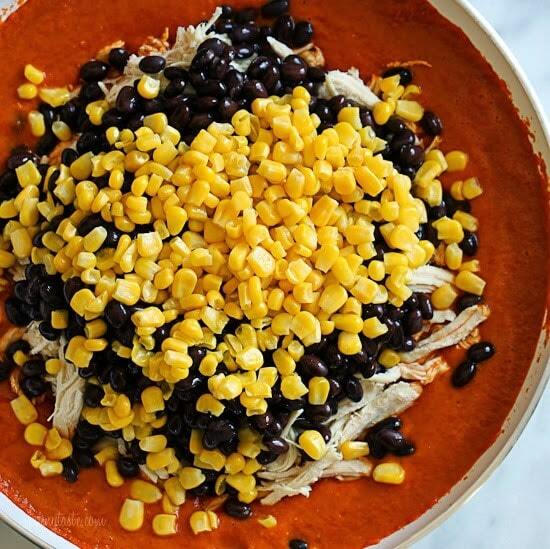 Pour the mixture into the large bowl with the shredded chicken, black beans and corn. Mix to combine, then pour over the spiralized sweet potatoes, making sure the sauce mixes well and gets in between the spirals. Top with cheese, cover with aluminum foil and bake 1 hour, or until the sweet potatoes are tender. Made this tonight for dinner and even my sick-with-a cold hubs loved it. I couldn’t find the dry chili peppers at the store so used chipotle chilis in adobo sauce but only 1 tablespoon since the hubs doesn’t like spicy hot food. I would have used 2 T if just for me. One problem: the cheese stuck to the foil so I lost most of it. I added more cheese and put it back in the oven uncovered for 5 mins to brown cheese. Any ideas on how to prevent the cheese sticking to foil problem?Thanks, Gina, for another delicious recipe. And the best news: there are leftovers!! OH, and I loved using my little spirallizer!!. Another hint: instead of using my big blender, I used my Breville stick blender in the little pitcher that came with it to blend up the sauce. Worked great! And, easier to clean……….. Yes, don’t make it too tight, I give it extra space so it doesn’t touch the cheese. This was so delicious and easy to make and I finally used the spirallizer on my food processor. Loved it! Tasted even better the next day for lunch. Very tasty! I substituted a 7 oz jar of roasted red peppers (without the liquid) since I did not have guajillo chili peppers and I put a very small amount of jalapeno in the blender. The sweet potato taste is uniquely tasty. Mine looked beautiful but there was a lot of watery liquid left in the pan when you scoop out a serving. I suspect it was the fault of my tomatoes . That part wasn’t pretty but it doesn’t take away from the fantastic flavor. Made this recipe on Tuesday. 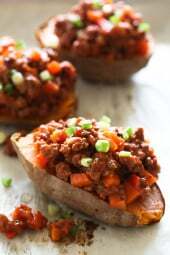 I am not typically a fan of the sweet potato, but I thought I would give this a try.. This dish WOWED me! It was the perfect combination of savory and sweet! This site has been a fantastic resource for me in my quest to reduce my calorie intake and choose healthier options with amazing flavors!! What a Win! Thank you. If you get the chipotle peppers in adobo sauce do you still have to boil them? Didn’t like this flavor and it is every food group my family likes. ? I followed the recipe exactly, except kept the seeds from the chile peppers when blended and thought if lacked flavor, which is surprising since it had so many different ingredients. I added some more salt and smoked salsa and it tasted significantly better. I am usually a huge ST supporter but I’m not sure if I’ll make this again. Make this one often! Use canned tomatoes generally (until the garden produces) and I sub the sweet potato noodles for butternut squash noodles. Very Weight Watcher friendly. Freezes good. It’s even better warmed up as leftovers! We forgot to buy tomatoes so we subbed 12oz of crushed tomatoes instead. We had already loved this, but the substitution of crushed tomatoes changed the text of the dish into wonderful comfort food. That’s a permanent change for us. Has anybody tried this with another kind of meat? 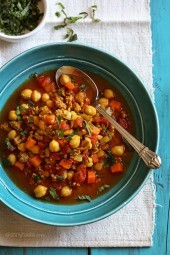 I’m guessing it would taste good with turkey breast… do you think it would taste good with ground turkey? update: I went ahead and made it ground tukrey- seasoned the meat with some cumin, paprika and whatever else I had on hand..t turned out great! Will definitely make it again! I used chipotle peppers in Adobo sauce and was a bit heavy handed, sauce was very flavorful but just a bit too hot. Did a quick glance around my kitchen for an answer to tame it down a bit and ended up making a sorta mole with some unsweetened cocoa powder, Mexican instant espresso and just a bit of sugar. Turned out Amazing! This definatley will be included in our go-to-list, with either version of the sauce. It was a hit at the pot luck I took it to. Am making it a second time with a few tweaks–My taste buds like a little more zing so I added a jalapeño pepper, increased the cumin and pepper and added some smoked paprika. I used cascabel chilies and they worked fine; I left in the seeds for the extra heat. Yum, yum, YUM. Has anyone tried to this for the slow cooker? This dish, prepared just like the recipe was awesome! They mention generous portions, you could cut the portion n in half and be satisfied! This dish is packed with protein and absolutely delicious. A note to my weeknight warriors, I did not notice the cook time…and it took me every minute of the hour plus… I’d been in the kitchen for a bit at this point when my son asked, “When’s dinner?” I laughed heartily and replied 8:45!! However, it was worth it! So many uses for these left-overs. A fabulous taco salad served over shredded lettuce. Quesadilla filling…burrito…BTW…this was my first experience with spiraling anything!! True blue pasta fan here! But I’m sold! Can’t wait to have a spiraled veg w/marinara, or pesto, or …???????? Here in Holland we don’t have pepper jack cheese. What kind of cheese is that? Also the peppers are not availeble here. What kind of peppers can I use instead? It’s a mild white cheese that melts easy with a little spice. I am not sure what a good pepper swap would be, it’s pretty mild in heat. This is a delicious recipe. The flavor was amazing and it was rich and filling, even with being mostly veggie based! I will definitely make it again! My whole family enjoyed it. Forgot to add..I didn’t have corn but had a can of hominy so I added that instead and it worked well with the other flavors. My daughter doesn’t like to eat meat and she is extremely picky. (She is 9) needless to say, I doubled the beans and corn. She had 5 helpings, wanted it for dinner the next night and then asked me to make it again!!! Id say it was a major win!!! Thanks for this great recipe. Hello! This looks and sounds so delicious. What do you recommend doing in place of a spiralizer? I’m wanting to make this next week, but I don’t have one! Hi, What can I use instead of the dried peppers? I could not find them. This looks wonderful! I’m a recently-diagnosed Celiac so it’s awesome to find what looks to be a great gluten free family meal. I have a quick (and undoubtedly silly) question, as I am a dried pepper newbie. Step 5 states: Remove peppers and let cool, cut the stem and and remove the seeds and the inside of peppers. Transfer to a blender. Transfer which part of the pepper to the blender- “the seeds and the inside” or the remaining part (skin?)? discard seeds and stems. Put the rest in the blender. Gina, do you now know what the NEW points will be on this dish now that weight watchers has updated their program?? Thank you!!! This was my first SkinnyTaste dish and I’m hooked! This was AWESOME, even though I was super skeptical the entire time, and scared to death that it was going to be too hot. It wasn’t and I am trying to resist the urge to gorge myself on its deliciousness. So, so good!!!!! I’m a believer! Lol, glad you enjoyed it Monica! First time to make this dish used very little cheese was delicious ! Is this a spicy dish. My kids are big wimps when it comes to spicy foods. 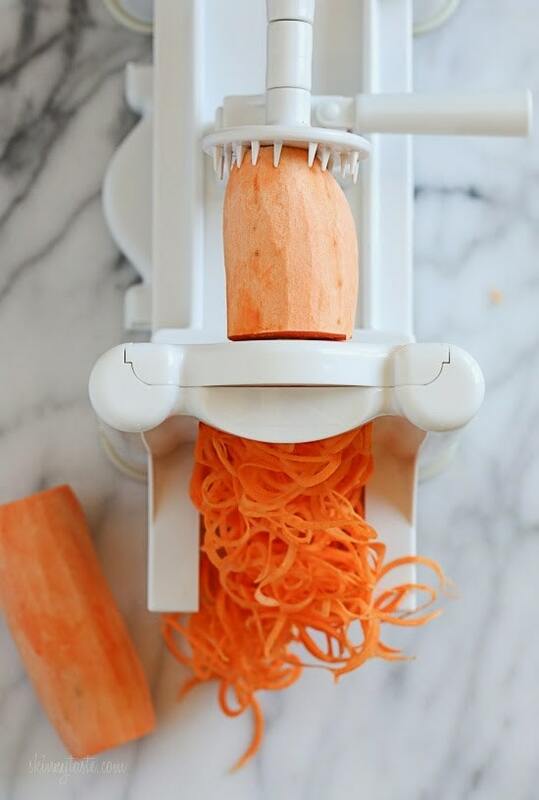 I could not get my spiralizer to work with the sweet potatoes. Any suggestions? I ended up chopping in small cubes, but think it would be better if they were spiralized. Made this for my husband and I and we loved it!! I haven’t cooked with spiralized veggies yet…I’m excited to try! Question is — Can I put this together tonight, but not bake it until tomorrow night?? I made this with butternut squash and it was yummy…and only 6 points. I made this tonight, with a few moderations and it was delicious! I don’t have a spiralizer so I just sliced the sweet potatoes. I put the sweet potatoes in the oven first since they usually take a long time to cook. After the chicken was done boiling and shredded, I mixed everything together and added it to the sweet potatoes. Total time in the oven ended up being about 45 minutes. I also left out the gaujillo chiles since we don’t carry them in the grocery store. Thanks for the great recipe! The whole family loved it! This tasted really good. The gaujillo chiles were easy to find in the international aisle at Publix supermarket. I used canned San Maximo tomatoes which was easy- no peeling. The spiralizer is not a deal breaker…mine stopped working while I was preparing this and I just chopped up the rest…after it cooks you really can’t tell it was .spiralized. Thank you so much for sharing this recipe! I have had it pinned for a while and finally made it tonight! My husband couldn’t stop saying how good it was – even got two fist bumps! 🙂 Loved it!! Have your cookbooks. Love your recipes. Can you use butternut squash instead is the sweet potato fir less smart points? I’m excited to try this tonight! 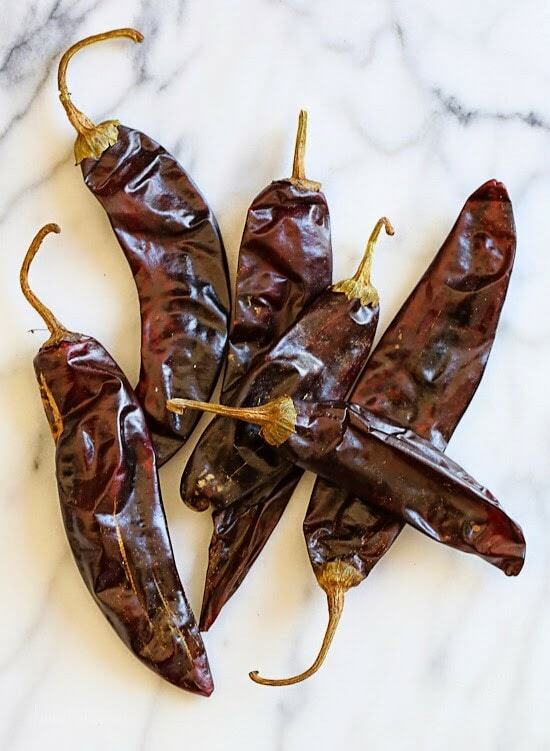 There weren’t any dried guajillo peppers at our grocery store, but I did buy Pasilla peppers instead (google told me they are similar in flavor to guajillo). The problem is that I, without thinking, bought fresh peppers instead of dried peppers. How big of a problem is that??? Either way, really looking forward to make this dish! I made this last night and OH MY GOODNESS was it delicious. I followed the recipe exactly as written minus the guajillo peppers. Instead I used 4 TB of chipotle in adobo (we like spice in our house!). We served with a bit of greek yogurt to manage the heat, avocado, and cilantro. YUM! This will definitely be a repeat at our house! Made this tonight and the family loved it! I could not find Guajillo chili peppers, but my local grocery store had Herdez Guajillo Chile Sauce in the ethnic aisle. It’s made with the Guajillo chillies, tomatoes, onions, and garlic, so I saved lots of time by not having to prepare the sauce. Other than that I followed the recipe exactly and I would definitely make it again! Made this today and my sauce looked nothing like that! As soon as I blended it I could see it was a much paler colour than yours, it looked very thin and watery. Yours looks almost concentrated. Add to that the onion and I ended up with a very thin, pale orange sauce that left a huge amount of water in the bottom of my dish after i served out the portions. The taste was ok, a bit bland as I imagined based on the diluted sauce. I think to make this again I would definitely buy a jar of tomato puree/passata from the store and use that over the fresh tomatoes! Jessica, where do you live & what kind of tomatoes did you use? I’m guessing that January tomatoes – especially plain ol’ industrial ones that are bred for shipping & shelf life and not for taste – might be why yours was so bland & watery…? I’m in Minnesota, so I use canned tomatoes coming into winter here & sadly for a long while now since almost all the ones in the groceries now will be boring & flavorless for months here! of fresh tomatoes added large can of san marzano tomatoes (not drained) and a couple of tablespoons of adobo sauce. We could not stop eating it! If you’re looking at the comment trying to decide if you should make this or not, the answer is YES! YES! Stop reading and go make this now! It’s so good and a very generous portion!!! Thanks Gina!!! Lol! Thanks Kaci! Glad you enjoyed it! I don’t really understand how this is a “skinny”taste meal. breaking it into 6 servings makes a portion about 1/6 of a chicken breast and 1/3 of a sweet potato which really isn’t a meal. Realistically a person is likely to eat it in two servings making it about 1000 calories a serving because its mostly starch with added cheese. If you read the recipe correctly, you’d know that a serving of this equates to 1/6 of a POUND of chicken and 1/6 of TWO sweet potatoes, plus corn, beans, sauce, and cheese. So, that means every serving is over 2.5oz worth of chicken plus 1/3 of a sweet potato, in addition to the other ingredients. And, as others have said, quite a decent sized and filling portion. Are any of your recipes senior specific? I LOVE your blog! Thanks for all the delicious recipes. 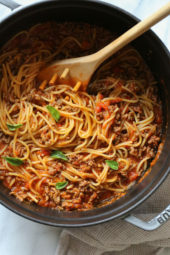 I came across this recipe tonight and was wondering if there is a way to make this without a spiralizer? Do you think it would turn out okay if I shredded the sweet potatoes using my Ninja, or just diced the sweet potatoes? I’m a fairly picky eater. I only eat chicken & Turkey and I don’t like spicy food at all. I made this dish, minus the peppers, and it was delicious. It had a lot of flavor but wasn’t overpowering. Thank you for doing what you do so that we can all eat ealthier. Could I refrigerate for a day or two before baking? Yes, I’ve done that and it still turns out beautifully. Do you think partial portions of this could be frozen? There are only two of us, which is why I don’t usually make casseroles (so we don’t end up eating the same dinner for an entire week). If I could freeze half for later, that would be great. Kelle, I am in the same situation and was wondering the same question! Did you try freezing? I’m thinking about freezing uncooked portions?!? Was wondering myself. Two adults and two birdlike children here. Wow! I was skeptical about trying this recipe, but I went on good faith and I’m glad I did. I really enjoyed it. Just made this for my husband and I to have for a few nights of dinner. Was super excited to use my new spiralizer kitchenaid attachment. The sauce was super tasty! We had a bunch of guajillo peppers on hand from a Mexican grocery store. I was wondering if more than 12 ounces of sweet potatoes would work. This one will probably become a ‘go to’ recipe! Thank you! if you don’t have a spiralizer, could you grate the potatoes instead? Will a red premade enchilada sauce work? I couldn’t find the chili’s or anything close to it in our grocery store. Approximately how much enchilada sauce would you use to substitute? This has just gone in the oven ready for a couple of meals during the week! I used my new spiral user attachment for the kitchen aid stand mixer…. made light work of the sweet potatoes! Also managed to find the dried peppers! I made this tonight and it was a big hit!